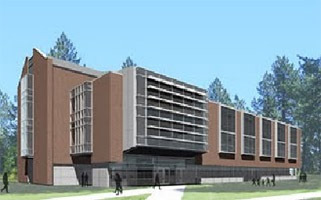 The Whitworth University Biology and Chemistry Building consists of a four-story post-tensioned concrete slab building with steel roof decking. ALLWEST provided materials testing and special inspection services for this $35 million dollar project. Specific special inspections and materials testing included soil and asphalt density testing, reinforcing steel inspection, post-tension tendons inspection, reinforced concrete testing, post-tensioned concrete testing, structural masonry inspections, spray-applied fire proofing inspection, and structural steel welding and bolting inspections. Ultrasonic testing of welds (NDT) was also conducted on the roof members.